The Vienna Boys’ Choir was founded in 1498 by the Emperor Maximilian I, who wanted the choir for a musical arrangement of the mass service. Initially composed of 14-20 children, this institution now has around 100 young singers, grouped into 4 choirs. It is worth pointing out that renowned composers of such stature as Bruckner, Haydn, Mozart and Schubert, among others, have all had close links with the history of the Vienna Boys’ Choir. 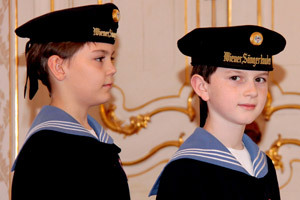 The wearing of sailor suits by the Choir is a custom that was established in 1924, and since that time they have worn them for public performances. Each of the four choirs undertakes an 11-week tour every year, as well as singing at the Holy Mass in the Imperial Chapel of the Hofburg Palace, attending various engagements in Austria (at Vienna’s opera houses and concert halls, and giving performances for national events), making various recordings and participating in other special projects. Enjoy these angelic voices, accompanied by the Camerata Schulz orchestra, and – should you so desire – greet them after the concert, when you can meet the Vienna Boys’ Choir in person (included only in the VIP category).